The iconic L-shaped Daytime Running Lights complement the headlights, so your vehicle is immediately recognizable as a Lexus. Overseas model shown. The distance between the NX’s front and rear seats comes in at an impressive 962 mm. Overseas Model Shown. A vibrant 10.3-inch multi information screen offers convenient access to numerous vehicle features such as the audio, climate and navigation systems. 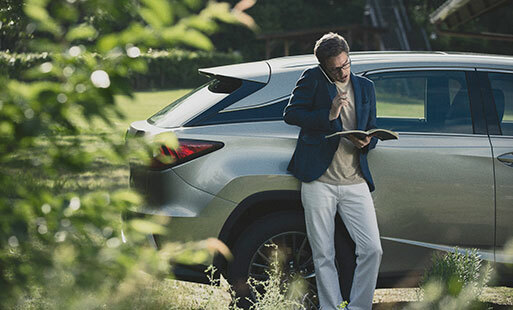 To conserve your fuel for a longer ride, the Stop and Start System shuts off the engine when your NX comes to a stop. Overseas Model Shown. Select performance to match your driving style with five drive modes: NORMAL, ECO, SPORT S, SPORT S+, CUSTOM. A 2.0-litre, inline 4-cylinder turbocharged, direct injection engine realizes both excellent fuel economy and exhilarating driving performance. The NX 300h F SPORT’s front grille combines a distinct F-mesh pattern with the same jet-black plating used on the RC F to make an undeniably bold statement. Collision impact is greatly reduced with eight sensor controlled SRS airbags lining the cabin, providing enhanced protection for all occupants. The PCS with Autonomous Emergency Braking is a collection of intelligent warning sensors that detects vehicles and pedestrians to help you avoid potential accidents.